Mega 602. 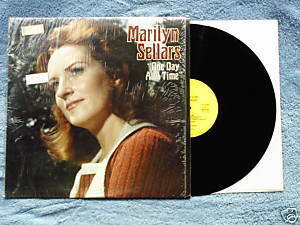 Marilyn Sellars. One Day at a Time. 1974 LP includes title track written by Kris Kristofferson Marijohn Wilkin, How Is He, The Rain's Got to Make a Living Too, When I Said Goodbye, California. Liner notes by Tom T Hall.. Produced by Clarence Selman. Title track by Kristofferson became a hit for Sellars; Art directions by Jack L Levy. Vinyl is VG/VG; cover with photo still protected by shrinkwrap is VG; price tags appear on shrink.